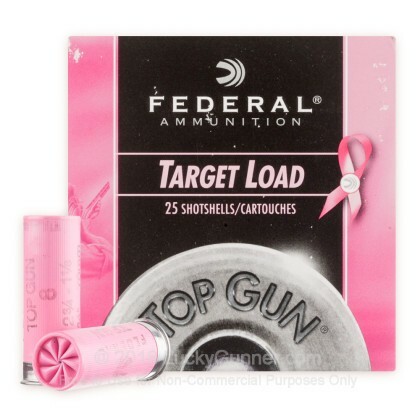 Federal Ammunition has joined the fight against breast cancer! 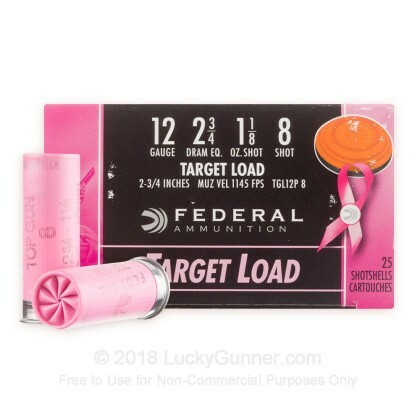 Federal is donating a portion of the proceeds from each sale of Federal Top Gun pink hulled shells to the Susan G. Komen foundation to help fund research for a cure to breast cancer. shot 100 rounds in my mossberg with no problems. good deal, no problems, would buy again. Good load at a good price, fast delivery and for a great cause. Good value, Good shells, Would buy again. Ran in my old win 1200, worked great no issues whatsoever. 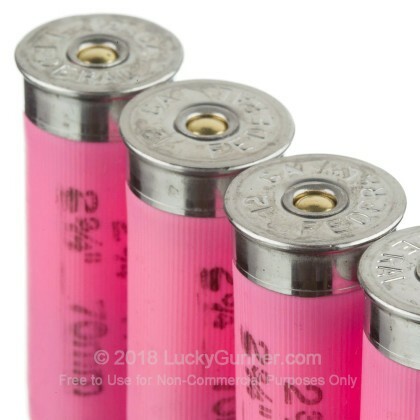 Pink hulls are easy to find and for some reason makes everyone at the range smile. Great price and fast shipping. I couldn't ask for more. We bought these because of Breast Cancer Awareness but it's a great value no matter how you look at it. Excellent value/price ratio, Very fast delivery, prompt transaction. Thank you. Good price, clean, fast shipping will keep buying from LuckyGunner. Great load for traps and part of the money goes to a great cause. These are a great load, the fact they have a pink hull make them easier to pick up after playing. Great load for traps and part of the money goes to a great cause. Good price, clean, fast shipping will buy again. 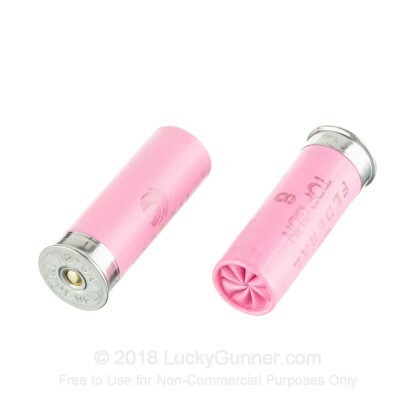 This shell has proven to be a great one for my sporting clay league. I will continue to buy them in the future. 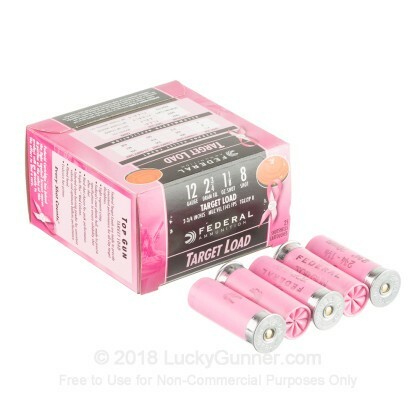 We also have this 12 Gauge - 2-3/4" 1-1/8 oz #8 Lead Shot - Pink Hull - Federal Top Gun - 25 Rounds ammo in stock in a smaller quantity.